EDWARDSVILLE – Visiting Muhlenberg College scored 14 points in the second quarter and 14 more in the third to secure a 34-0 win over Wilkes University Saturday after at Schmidt Stadium spoiling head coach Trey Brown’s debut for the Colonels. The Wilkes offense was unable to find its rhythm under Brown’s new scheme. Wilkes falls to 0-1 on the season while Muhlenberg improves to 1-0 after claiming its season opener. Defense was key in the first quarter as both teams’ offenses struggle through the first fifteen minutes of play. Muhlenberg put three on the board with 5:32 left in the first frame when Connor Winter kicked home a 45-yard field goal after a Mule drive stalled at the Wilkes 35. The Mules opened the second quarter with their first touchdown of the afternoon as Michael Long caught a four-yard touchdown pass from Nick Palladino to up the advantage to 10-0. With the score still at 10-0, Muhlenberg used one last effort to end the half as Ryan Delaney connected with Palladino for a 28-yard pitch-and-catch to give the Mules a 17-0 lead heading into the break. Two more scores in the third, a two-yard run from Thomas DiCarlo and a 31-yard reception by Nick Lamb from Palladino pushed the lead to 31-0 with 8:30 left in the third. Winter added another field goal, this time from 33-yards out, to cap the Mules scoring at 34. The Wilkes offense was unable to find its rhythm under Brown’s new scheme and its hurry-up spread offense. The Colonels punted eight times and lost the ball on downs three times to end any type of promising drives throughout the contest. Wilkes’ best drive came midway through the second quarter when the offense went five plays and twenty yards moving to the Muhlenberg 37 before a loss of downs ended the flurry. The ground game suffered as Wilkes accounted for -5 yards on 26 carries as a team. Ryan Behrmann and PJ Incremona each carried the ball seven times for ten yards to lead the way. Ryan Dailey, earning his first collegiate start, finished 9-for-22 for 75 yards and two interceptions. Marcellus Hayes entered in relief of Dailey going 6-for-12 for 42 yards. Palladino enjoyed a fine day for Muhlenberg finishing 15-for-22 for 167 yards and three touchdowns. Nicholas Savant led the Mules ground attack with seven carries for 54 yards. Nick Lamb was Muhlenberg’s top threat on the outside posting five catches for 99 yards and one score. 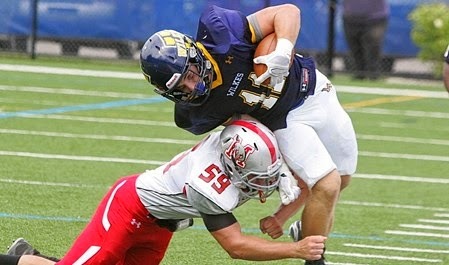 Wilkes continues its home stretch next Saturday hosting local rival Misericordia University in both teams’ Middle Atlantic Conference opner at 1:00 p.m. at Schmidt Stadium.